For recording, first a master disc is prepared. The laser beam acts as a stylus, which is modulated by digital audio signal. For this the audio signal to be recorded is obtained from the microphone, amplified and sampled @ 44.1 KHz with digital quantization of 16 bits. Thus 7 mega bits (44.1 x 1000 x 16) per channel per second are used to modulate the laser. This modulated laser is made incident on the CD. When laser beam is ON, the output is 1 and when the beam is OFF, the output is 0. It forms pits on the photo resist material of the CD. For replay a disc, a focused laser beam of suitable wave length, is made incident on the CD tracks through a mirror, A half polished mirror is used, as it allows the laser to pass through it, but does not allow it to return. The reflection of laser beam from pits represents 0 and from space represents 1. This reflected beam is again passed through a focusing system and then through a photo diode is fed to a digital to analog converter. The analog signal so obtained is fed to a loudspeaker for reproduction. 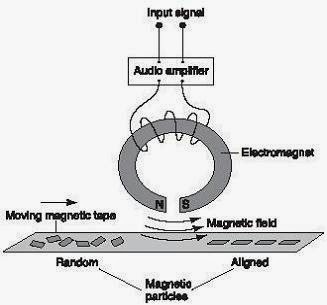 Magnetic Recording and Reproduction of Sound: This is widely used system for recording audio signals. 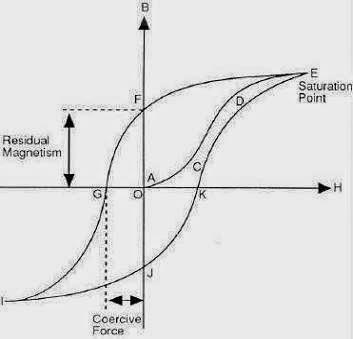 The basic principle involved in magnetic recording is the phenomenon of electro-magnetic induction. The audio and video tapes are coated with a magnetic material. The signal (audio or video) currents induce magnetism in the tape. The track is in the form of magnetic path on the tape. For audio recording, the audio signal is given to the microphone which converts it into electrical pulses. 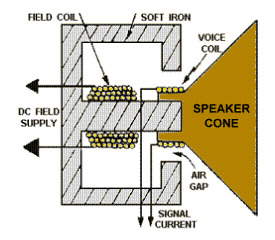 This electrical signal is amplified and the amplified current is sent through the audio head coil. If magnetises the head. The magnetic strength of the audio head goes on changing in accordance with intensity of the audio signal being produced at the microphone. The magnetized audio head is moved on the audio tape. The audio tape is covered with a layer of ferromagnetic material like ferric oxide. As a result tape is also magnetized; the strength goes on varying according to the signal. By magnetic induction, “magnetic track” of sound is formed on the tape which contains audio signal. The voltage obtained at the output of amplifier should not have any distortion otherwise during replay; the same will come into play. The core of the head is made of soft alloy, hence it does not have any residual magnetism, therefore it will not give any distortion. However, “demagnetisers” may be used to demagnetize the head immediately after it has done its job. For magnetic recording, generally the following methods are used. 1. Longitudinal Magnetic Recording: In this method, the tape is moved longitudinally to the recording head. The North and South, both poles are kept on same side of the tape. The method is simple and gives satisfactory results. This is commercial and a very popular method of recording. 2. Transversal Magnetic Recording: In this recording, the poles of the record head are kept transversal to the tape. In this case the record head needs special construction and also it is a complicated method. Results are also not so satisfactory as in the first case, hence it is not used at commercial level. 3.Perpendicular Magnetic Recording: In this method, the tape moves normal (at perpendicular) to the poles of the record head – one pole on each side. Reproduction or Replaying: For reproduction of the audio signal “play head” is moved on the tape. This activates the play head. 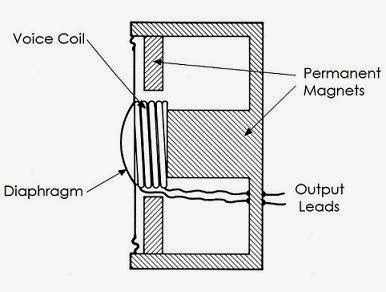 The recorded magnetic path (sound track) induces currents in the play head coil (by electromagnetic induction).These induced currents are amplified and given to speaker which by transducer action converts the currents into the original sound. Nature of Sound: Sound is a longitudinal wave motion. It has compressions and rarefraction in medium of travel. Air acts as medium for sound propagation. Sound follow simple Harmonic motion. When sound wave strikes the ear drum, they are changed into Audio signals. These signals are carried by nerves to the Brain, where they are sensed as sound. Sound has three dimensional motion in air. When source of sound i.e., tuning fork is gently hit by wooden hammer, a pure tone is generated. This tone remains for some time and gradually decreases. Due to vibrations of tuning fork, compressions and rarefractions are produced in air. When they reach the Human ear, they cause sensation of sound. Observe that the direction of propagation is longitudinal. There are compressions and shown with closed vertical lines and rare fractions have been shown with vertical lines which are apart. The changes in pressure produced by compressions are shown by curve of continuous line, whereas pressure changes produced by rarefraction are shown in figure. A wave has Amplitude, frequency, wave length, phase and velocity. Let us know about them. Amplitude: It is the intensity of compression and Rarefraction produced in the medium. For a pure tone the intensity can be represented by a sine wave. A cycle has compression (+ve side) and rare fraction (-ve side). Frequency: The number of repeated compressions and rare fractions in one second is termed as Frequency. Unit of frequency (f) is cycles/second or Hertz (Hz). Time Period: The time taken to complete one cycle of sound wave. Time Period, T = 1/f Hz Seconds. V = Velocity of sound in meters / second. Velocity: Distance travelled by the sound wave in one second. The velocity of sound in space is 344 m/s at 20 degree Celsius. At 0 degree Celsius it is 332 m/s. It is clear that sound travels slowly when compared with light. So, Velocity of sound is affected by Temperature, but not by pressure. Also, velocity of sound depends on density of Atmosphere. r = A constant of medium of propagation for air. It is 1.41. So, we can observe from the above, velocity of sound is inversely proportional to density of medium. Velocity of Sound is slow in gases. Velocity of Sound is faster in liquids. Velocity of Sound is fastest in Solids. Phase: It gives instantaneous motion relative to some reference. Phase can be expressed in angle or wave length or time period.The phase angle shown above cvan be mentioned as 90 degree or T/4 or λ/4.